KAHNAWAKE, QC--(Marketwire - March 8, 2011) - All Slots Online Casino (www.allslotscasino.com), a leading online slots casino and slot tournaments pioneer, is proud to host the upcoming Grand Slam of Slots II, scheduled to take place this May 27th-June 6th. The casino will be awarding tickets to this incredible event through its free-entry qualifier slot tournaments beginning March 14th. The final event of the online slot tournament will celebrate the premiere of Thunderstruck II as a slot tournament game -- the first of which to offer 243 ways to win. In the game's honour, the tournament boasts a remarkable jackpot prize of $2.43 million in gold bullion, as well as $290,000 in additional cash prizes to the top 290 winners. 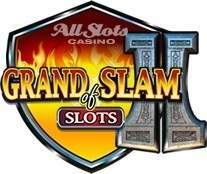 "All Slots Casino is thrilled to host the Grand Slam of Slots II this year," said David Brickman, Jackpot Factory's Vice President for Player Affairs. "We would love to see one of our players take home $2.43 million in gold, and are proud to offer our players the opportunity to win such an amazing prize. Thunderstruck II is a remarkable game, and was an instant hit when it launched at the casino in May 2010. I'm sure it will be a thrilling addition to our slot tournaments line-up." All Slots Casino is dedicated to responsible gambling and takes its social responsibilities seriously. It is proactive in preventing underage play and in providing assistance and support to members who develop gambling problems. All Slots Casino is proud to host the Grand Slam of Slots II online casino slot tournament, featuring Thunderstruck II. The casino will award tickets to the final event through its free-entry qualifier tournaments running March 14-May 23rd.